We're getting ready for our next Walt Disney World adventure to the Flower and Garden Festival and the opening of Epcot and Star Wars Weekends. While there I hope to pick up some gardening tips and souvenirs to bring back. 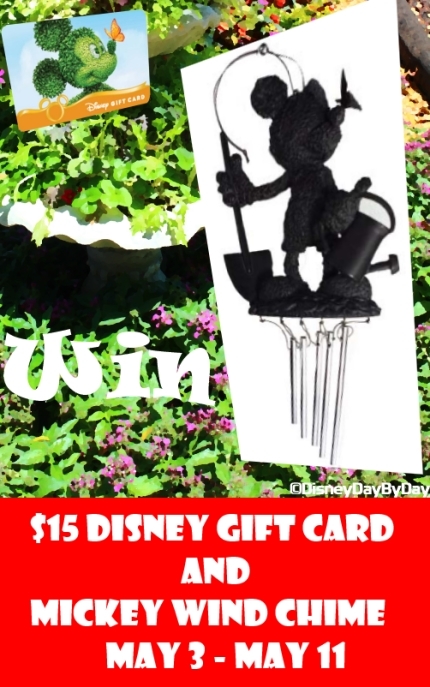 How would you like to win a Mickey Wind Chime for your garden and a $15 Disney Gift Card to use on your next trip. Sound good? Join us along with my friend Sean at Disney Day By Day who is the host of the giveaway and a few of our fantasmic Disney friends for your chance to win. The giveaway will run from Saturday, May 3, 2014 until May 11, 2014 at 11:59 PM EST. More ways to enter! There is a daily entry for more chances to win. The lucky winner will be announced right here on the blog, Focused on the Magic, after the winner has accepted their prize.